As Sega delivers its range of retro 3D reproductions to the 3DS eShop, it'll certainly be interesting to see how sizeable an audience warms to each release. For some, fond memories of iconic Sega arcades or home console ports will make purchases irresistible, but perhaps the greatest challenge facing these releases is standing up as worthwhile download offerings in 2013. While 3D Space Harrier stacks up pretty well in the opening salvo, considering its simplicity of play, it perhaps falls to 3D Super Hang-On to kick it up a gear. And it does. 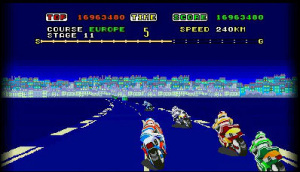 This has always been a relatively fast-paced and simplistic bike racer, most memorable for its arcade units; its port on the Mega Drive / Genesis had a fairly wonky frame-rate, which means it's a major positive that this is based on the superior arcade original. The game tasks you with dashing between checkpoints and topping up your remaining time, with each segment likely to take anything from 30 to 50 seconds. There are four classes to tackle — Beginner, Junior, Senior and Expert — that become increasingly lengthy; despite this there's little getting around the fact that a skilful player will be able to blast through them all in around an hour, assuming they pause for breath and have to restart once or twice. That's an undeniable truth, but this package does offer up an unlockable World Tour that strings all four classes together, and though a run-through of this is just 30 minutes, it's an intense and highly focused half an hour. 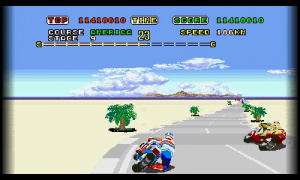 Super Hang-On is a title that incorporates borderline ludicrous speed — your bike is regularly going at a ridiculous 300km/h+ — and twitch controls to remind your thumbs of some old-school challenge. It's an '80s arcade experience through and through, in that realism is superfluous to the need for challenging fun and — in those days — gobbling up all of your pocket money. What's enticing about this package on 3DS is not just the additional World Tour mode, but all of the ways that you can modify the experience. 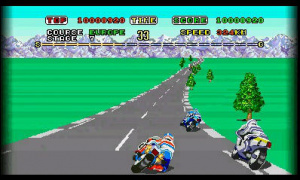 One key feature is the ability to set the difficulty in terms of your opponents on the road; though you're not racing others for placings — it's a timed dash, remember — rival bikes do nevertheless pose more danger than the roadside obstacles that you'll occasionally hit. They can be tricky to avoid — sometimes infuriatingly so — on bends in particular, but this download allows you to go from the extremes of making them matter-less ghost bikes that you pass through, or alternatively entirely obnoxious jerks that swerve to get into the way. We found the middle-ground works best, but the settings cater to different crowds. In addition you can edit controls or try out alternative control schemes that forego the standard physical inputs. The most intriguing is the surprisingly effective Gyro sensor tilt option, which actually allows for a fairly tight degree of control, albeit while ruling out the practicality of the stereoscopic 3D visuals. It's also possible to steer with a stylus on the touch screen, though as you still hold down an acceleration button this seems rather needless. The best option, unsurprisingly, is the Circle Pad or D-Pad to steer, while we liked mapping accelerate to Y and turbo boost to R — yet the flexibility is there to do as you wish, which is welcome. There are also some options that are sentimental fluff, but may give a kick to retro enthusiasts and newcomers alike. There are four different screen-sizes — full screen arguably has the best effect but does stretch the pixels, so there's a slightly narrower ratio as well as two smaller screens that have simulated arcade cabinet surroundings. You can even choose between the "Mini Ride-On Type" and "Sit Down Type" cabinets, while you can enable the option to have the screen tilt and sway as it would in the arcade. The latter option is fun for a one-off, but actually distorts the graphics in an odd way; after trying out the tilting screen we promptly disabled it. Further fan-service is offered with the facility to play any of the game's music tracks at will while messing about with a sound equaliser; again, not necessary, but a thoughtful inclusion. We also can't help but be impressed with the strength of the port both visually and aurally — the smaller screens give the pixel-based visuals a sharpness they lacked in the console days or on an arcade cabinet, and the four music tracks on offer still rock our world. When blasting through the World Tour you can hear the full soundtrack over 30 minutes, and it's definitely best enjoyed with headphones. The performance is impeccably smooth with full 3D enabled, and the stereoscopic effect is pleasingly effective; fans may get a thrill the first time they see an opposition bike noticeably in the distance. The 3D visuals also help with handling corners, to a degree, making it easier to sense how sharp a turn is going to be. Most importantly with 3D Super Hang-On is that it's a lot of fun to play in this iteration. It's fast, exciting and can demand the quickest of reactions. Simply blasting through full speed will see you crash at the side of the road, and eventually players will gain a sense of the slightly bonkers arcade logic to proceedings. What it's not is an accurate racer or sim, and its brevity may bother some that aren't immediately enraptured by its style and presentation. 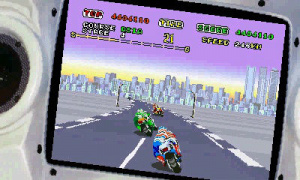 3D Super Hang-On is a solid demonstration of how a fondly remembered arcade title can be repackaged and kept relevant on new hardware. Each addition either adds a pleasing twist or, at worst, can be ignored and left unused. It's a package full of care and fan-service, but this super-smooth and quick iteration is also a lot of fun today, stripping away any performance-related frustrations for those that encountered the 16-bit home console version. It's a short ride, sure, but one that's worth jumping into again and again. I'll definitely be picking this up. 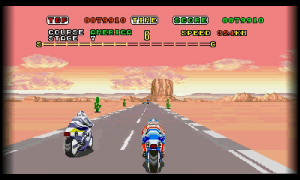 Super Hang-On was the first game I played when I got my Megadrive, so admittedly it will be purely for nostalgia. 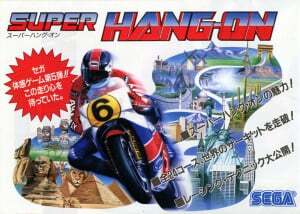 I do loves me some Super Hang On. First played it in arcades then, of all things, the Commodore Amiga 500 using the mouse. I plan on buying all the Sega 3D games in the next 3 weeks. A proper Sonic the Hedgehog and not that atrocious Sonic Genesis port for GBA? Please and thank you! I may be crazy, but I am more interested in this one than Space Harrier, although most likely I will be getting both. That myriad of options and AI settings sound awesome. Although Outrun had that fantastic presentation, I thought this game was the greater challenge when it was released in the arcades the year after. Yep, will be grabbing this. This is an awesome game and is perfect for pick up and play. I never gave it much playtime back in the day, but playing it on the 3DS has truly made me appreciate it. I can't wait for more 3D Classics! This was WAY better than I expected. Great review Tom. I've actually been playing it more than Space Harrier, which I never would have guessed. Dang, this sounds awesome! Though I'm looking for something to download on my 2DS when I get it, I will definitely be getting this on my 3DS! The gameplay reminds me a bit of Pole Position, and I enjoyed that game a lot! I recently revisited Out Run on the Genesis and was a bit surprised at just how much fun that was so I sampled a bit of Hang On and found it to be quite fun too. Sega's early scaler racing games hold up very well as they are just a lot of fun to play. They may be simple since they are arcade games but may offer more fun than some other games that boast greater depth. I've been playing this more than Space Harrier myself. It's so fast and fun! Yep, ill be picking this up for sure. I've been playing this game for years on my Genesis, still is fun every time. Only reason I didn't buy this Day 1 was because I wanted to try a new 3D Classic instead of one I know I'll love. I never found these kinds of arcade games very compelling in terms of pure gameplay design but this looks very solid and I think I'd actually like to play it. Overall it sounds pretty good, but only having "time attack" modes turns me off. I'll pass on this one. got it day 1 of course! playin it side by side with mario3DW all day long! Never played it before so I look forward to it! I downloaded it and playing the hell out of it. And I still did not beat the beginner class after 90 Minutes of playtime. Outstanding game. I first played this game in 1988 in Disney World, and everytime I hear the music it takes me back to that time. I love this game, and it holds up pretty well. Hmmm these games seem too good I'll probably invest in them at some point. I was thinking of buying this. Looks like you sealed the deal. Love the old arcade classic racers, certainly the most fun to play. Wasn't a huge fan of the original arcade machine, but I'm wondering if this does well enough if Nintendo will ever consider dusting off the old (and probably forgotten by most) NES Rad Racer for a 3DS port. If I remember right, that used 3D glasses too for effect. Still not sure. The Hang On in Shenmue took me ages to 1 credit. (Which you need to get the prize). Love this game, been playing it more than the new zelda Mind you, I only play zelda when I have near unlimited time, i only like to stop when I feel like it. I LOVE that these new Sega games are based on the arcade! 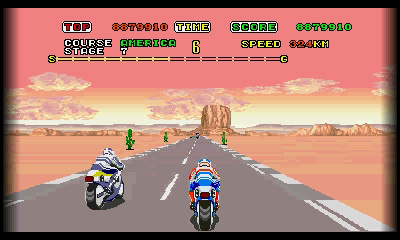 When do we get Road Rash 2 for the 3DS? I want to slam people off their motorcycles with a lead pipe! This game is the fastest thing I've played since F-zero Maximum Velocity! Ah, it's such a shame Nintendo stopped converting their own classics to 3D...I would love to see things like Super Metroid or SMB3 in 3D. Have this game on 360 that came with Alex Kid and Shinobi. I might just get this on 3DS. A Sega legend that has aged well. 9/10 from me. @Spoony_Tech: Dude this game is awesome. You should reconsider. @KnightRider666 You know after reading some comments and the fact I do like racing games I might just eat my words! @KnightRider666 This is already one of my favorite racers, and I never even owned a SEGA system! Yeah, I got Space Harrier too. Not as good as Hang On, but still good. @Giygas_95: We get Altered Beast and Sonic 1 this week. I wonder if Altered Beast will be arcade or genesis version? The review is spot on. Although if it was just Hang-on and not 'Super', it would have been boring. @KnightRider666 I would imagine the arcade version. I don't personally know the difference because I never played these games before, but I'm glad we've gotten what everyone says is the superior version so far. Not interested in Altered Beast, but 3D Sonic will be my first Sonic game (if you don't count Sonic Battles 2 which I never liked). Wish I could get it. No funds right now. anybody know how many levels/tracks it has? it sounds good from the review and comments, but i would like to make sure it has a decent amount of tracks b4 i decide to get it. @Giygas_95: Actually when it comes to Altered Beast, I feel the Genesis version is superior to the arcade version in this case. Sonic 1 is the best Sonic game in my opinion. Lots of fun I love the Night Racing on expert. I always loved that effect similar to Enduro from the Atari 2600. @Giygas_95 It's the genesis version, which makes more sense, since there is no way to put any fancy options into the arcade, but the new gigadrive emulators (an upgraded genesis for the 3ds) gives ton of option to play the game is sega genesis or mega drive mode, classic CRT tv option and of course some extra difficulty settings and some other surprises we not no of until the interviews. You should look for the sonic the hedgehog interview its really detailed on what they did for the gigadrive. @3dcaleb You get both versions the ride type and sit down type with separate high scores. The sit down type has a couple of modified turns in their stages. If you beat everything then you unlock world tour, and you play all the stages through one race. There are 4 ways to play the game and by modifying the difficulty and time settings can make even the least responsive control setting playable to the end. @drexegar Thanks, I will! By the way, what's the difference between the Genesis and Mega Drive modes? Sweet... Now that Genesis is rolling on the 3DS, can we get some SNES titles? @Gioku If you have a 3DS then why would you get a 2DS...and then look for games that don't utilize 3d? That just doesn't make sense to me, but whatever. @MC808 I want a second system in the house, and the 2DS is the cheapest. I wrote that a long time ago, though, so we might be getting another regular 3DS after all. You know, im starting to become more and more impressed with the M2 ports that have been coming out. I feel like they put Virtual Console to shame. I would pick this game up, but unfortunately I do have it on PSN so I dont think I'll double dip. I know this isn't for the 3DS version, but one nifty thing about the Sega Ports is you can have a universal jukebox throughout all of the games. So I can be playing something like Toe-Jam and Earl and enter the jukebox mode and have music from other Sega games like Super Hang-On or Space Harrier playing. It would be a nice addition that could be added to the 3DS games.